Bassett “$10K Holiday” Sweepstakes – Win a $10,000 store credit! Win a $10,000 Bassett Home Furnishings store credit! ENTER SWEEPSTAKES HERE – Bassett Furniture Sweepstakes page. ENTRY LIMIT – There is a limit of one (1) entry per Entrant/email address per day. delivery radius of a Bassett Home Furnishings store location throughout the Sweepstakes Period and awarding of the prize (the “Entrant”). Eligible delivery radius will be determined via the Entrant’s zip code on Sponsor’s website (www.bassettfurniture.com). 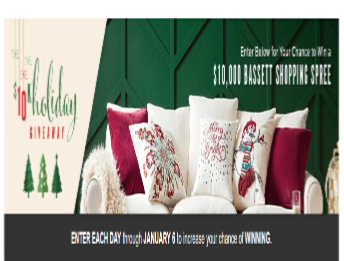 SWEEPSTAKES ENTRY PERIOD – Bassett “$10K Holiday” Sweepstakes begins at 12:00 am Eastern Time (“ET”) on November 1, 2018 and ends at 11:59 pm ET on January 6, 2019.